Suicide is the single biggest killer of men under the age of 45 with figures suggesting that a third of this age group have considered ending their own life. In 2016 there were 4623 male deaths from suicide, that’s one every two hours. This campaign was designed to bring this often taboo subject to the forefront of people’s consciousness, to showcase the issue above many of the the other things which may more often be discussed. 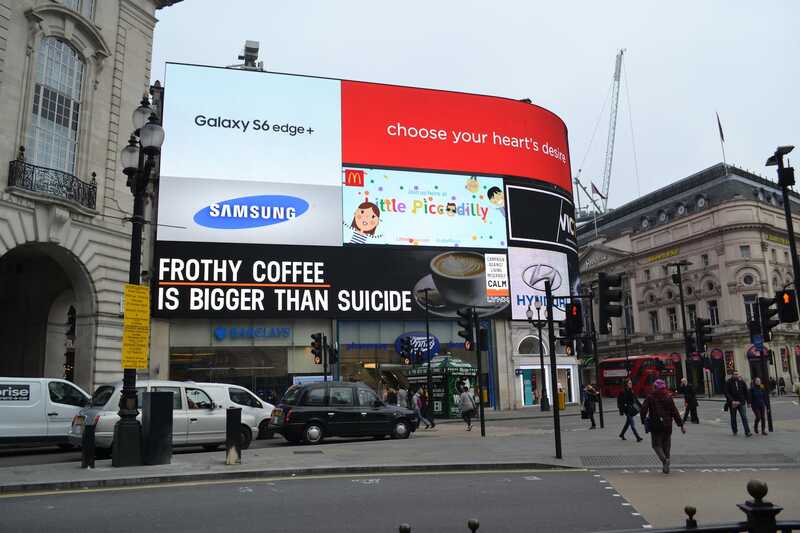 Screens displayed these subjects as #BiggerIssues than suicide; juxtaposing them with trivial topics that were actually trending, such as ‘lemons in Manchester’ and ‘red cups in London’. Creative changed every two hours – mirroring the timeframe in which an additional death from suicide would statistically take place. This worked to shock people into looking at why they, as well as social media conversation so often neglected the subject. The culmination of the campaign was a day where male suicide became the big issue. Supporters provided messaging with the campaign being then picked up by the national media. This ‘thunderclap’ trended with a total reach of 23 million people, with YouGov figures putting the increase in awareness at 45%. The campaign went on to win over 60 awards including a Cannes Lion, D&AD impact award.